There is none like you, Oh Magnificent Father. No one else can touch our hearts the way that you do. We can search all eternity, Lord and find there is none like You. You are King of kings and Lord of Lords. You reign over all the earth. Worthy is your precious name, Jesus, lamb of God. We surrender all the glory, honor and praise to you, withholding nothing. I Corinthians 15:57 But thanks be to God, who gives me the victory through our Lord Jesus Christ. 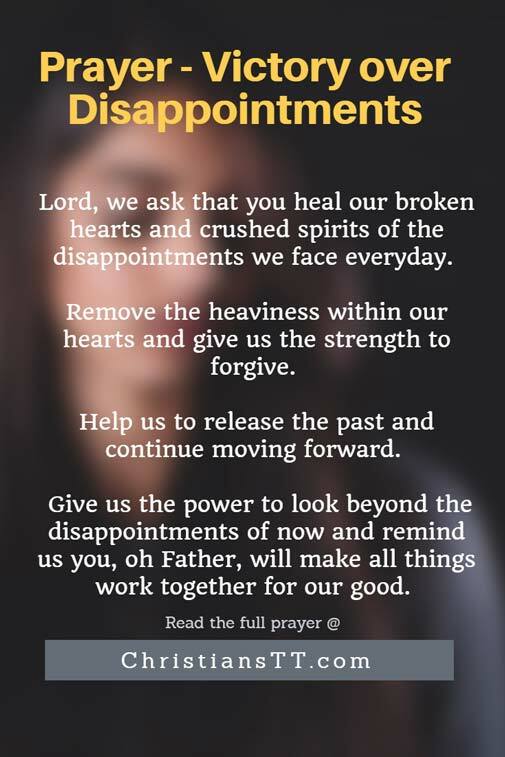 Lord, we ask that you heal our broken hearts and crushed spirits of the disappointments we face everyday. Remove the heaviness within our hearts and give us the strength to forgive. Help us to release the past and continue moving forward. Give us the power to look beyond the disappointments of now and remind us that everything happens for a reason. Remind us that you, oh Father, will make all things work together for our good. Help us to remember that You always have great things in store for us. Lord, help us to be still and remember that you are God. Romans 5 : 5 Hope does not disappoint, because the love of God is shed abroad in my heart by the Holy Spirit who is given to me! Omnipotent Lord, this is where we start our comeback. We will spend no more time reminiscing on our present disappointments. No more time questioning You as to why doors have been closed, because we’ll be too busy praising you for the magnificent ones that are about to be opened. Help us to dance in the rain as life’s toughest storms emerge. Give us wisdom, understanding and grace to embrace the wonderful blessings ahead. We declare that all that was taken away, be replaced with even better, in Jesus mighty name. Amen! !